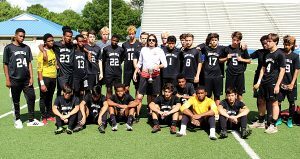 A tough bounce in front of the Druid Hills goal found its way to Leonel Lugo with 1:47 left in overtime for an easy goal to allow the Southeast Whitfield Raiders to pull out a hard fought 3-2 Class 4A state championship victory at McEachern High. The game went into overtime tied 2-2 as the No. 3 ranked Red Devils (16-7-0) and No. 2 ranked Raiders (20-2-0) fought to the tie at the end of regulation. The first overtime was uneventful as neither team could score in the five minute period. A corner kick for the Raiders set up the winning score as the clocked ticked down under two minutes to go before the penalty kick session. 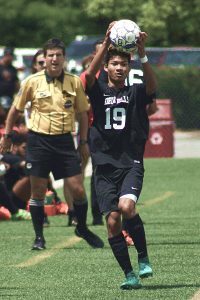 Druid Hills knocked the corner kick around a couple of times in an effort to get the ball out, but one final bounce found its way to Lugo who was able to find the open net on the right side for the winner. The Red Devils could not put up a score in the final 1:47 to fall in the state championship round for the fourth time in four tries. Druid Hills was in the finals in in 1972, 1978 and 1988 with all three losses coming to DeKalb rivals. Southeast Whitfield got on the scoreboard first as Uli Dominguez took a pass from teammate Saul Lerma on a sliding kick to score less than three minutes (37:16) into the game for the 1-0 lead. Josh Lloyd, who had seven saves in goal for Druid Hills, battled over the next few minutes with a pair of big saves to keep the Red Devils close despite the pressure from the Raiders on offense to extend the 1-0 lead. A hand ball call in the box on Southeast set up a penalty kick by Druid Hills’ senior Luke Narker. Narker knotted the game at 1-1 with a nice kick to the goalie’s right with 23:11 left in the first half. Lugo avoided the Druid Hills’ defenders on a long drive to the goal and scored for a 2-1 lead with 16:34 to play in the first half that would hold up through halftime. The Red Devils picked up another penalty kick as a foul on Hasib Fudaeel was called with 32:44 remaining in the game. Fudaeel converted the shot to tie the game at 2-2. Lloyd had a pair of saves at the corner of the goal with 12:30 and 9:24 to play in the game to keep the score at 2-2. Southeast goalie Raul Servin would send the game into overtime as his save off a header by Druid Hills with 4:11 kept the game tied at 2-2. Fudaeel and Narker finish the season with 15 goals each to tie for 8th overall in the DCSD goals scored standings while Connor Logue was tied for third with 10 assists on the year. Lloyd finished the season with a 0.90 goals allowed average to lead the DCSD goalies for the season. Druid Hills’ head coach Thomas Bodnar (53-37-7, 5 seasons) was also named the Class 4A Coach of the Year for leading the Red Devils to the runner-up finish.